Last but not least in our brief interviews with Midsummer magicians, a chat with the Music Director of Seattle Opera's Young Artists Program! 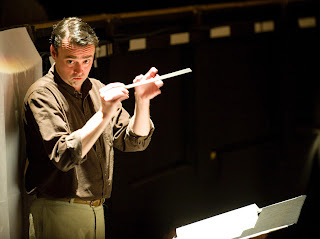 JD: Brian Garman, Seattle Opera is delighted to have you leading your second YAP opera, following your success last year with L’enfant et les sortilèges/Gianni Schicchi. Since you are still new to some of us, tell us a little about your own musical background...what instrument(s) you’ve played, whether you’re a singer, who is your favorite composer. BG: Thanks, Jon, I'm also delighted to be here! I've played the piano practically my entire life (since I was five), and that's my main instrument. I played a bunch of brass instruments in high school, and took some string method classes in college, but piano has always been my primary thing. I majored in piano in college briefly, but then switched to voice, in which I got my first degree. Then I received my Master's in vocal coaching from John Wustman at Illinois, and started working as a pianist and coach in opera houses. This led to conducting almost immediately, and at age 25, I conducted my first opera, which was Mozart's Clemenza di Tito. And since you asked, my favorite composer is Verdi. I could conduct only his operas for the rest of my career and never be bored. JD: Before Seattle Opera asked you to conduct these performances, what was your background with A Midsummer Night’s Dream? Had you conducted it before? Heard other productions, recordings, etc.? Are you a big fan of the play? BG: I did a production in Pittsburgh in 2003, which proved to be very helpful for this current process, given that it was a new piece for the orchestra and for 16 of our 18 cast members. Had we all needed to learn such a difficult score from scratch, this would have been a very arduous process indeed! Of the relatively few recordings available, I think Richard Hickox's is by far the best -- it captures the humanity and humor of the score marvelously. Britten's own recording is good too, but I think Colin Davis's is a lot less successful, even though I have a number of friends singing on that recording. I have read the play, of course, but I have to confess that I've never seen a staged production of it. JD: Midsummer is a notoriously difficult score, and you had very limited rehearsal time. Tell us about the homework you did to make sure you were prepared for those high-pressure rehearsals. BG: Yes, notoriously difficult and yes, very limited! In fact, with the orchestra, we had only enough time to get through each act once before we began to rehearse the orchestra and singers together. What one does to prepare is to anticipate -- either by experience or extrapolation or both -- where the problem spots are going to be: what are the most difficult things to play technically, and what are the most difficult passages to synchronize as an ensemble? Once those have been identified, you essentially create a mental schedule and "lesson plan" for the rehearsal based on predicting how much time each of these difficult sections will take to rehearse. JD: What’s the hardest part of A Midsummer Night’s Dream, from your perspective? BG: Oh, it's difficult to say, because almost every page poses its own set of challenges. All the scenes with the Rustics are particularly difficult -- they're fiendishly tricky for the cast in terms of rhythm; and there are many exposed and virtuosic solo passages in the orchestra, in addition to having to synchronize those instruments playing on the beat with those playing off the beat. It's occasionally a nightmare of rhythm! JD: What’s your favorite moment (or passage) in the opera? BG: For me, it would have to be the last nine or ten minutes of the second act, as Puck is luring the lovers onto the stage to fall asleep. The trumpet solos above the fantastical shimmering string chords that then dissolve into that beautiful children's chorus -- it's magic, plain and simple. JD: Thanks, Maestro Brian Garman, and we look forward to listening this weekend! The production was wonderful. It is clear that Peter Kazaras understands the central role of acting in opera. In addition to having wonderful voices, the performers for the most part (well, the dog should be excluded)had excellent acting skills, which added to the audience's pleasure and understanding of the story.